I don’t just view beets as a non-toxic source of food coloring. 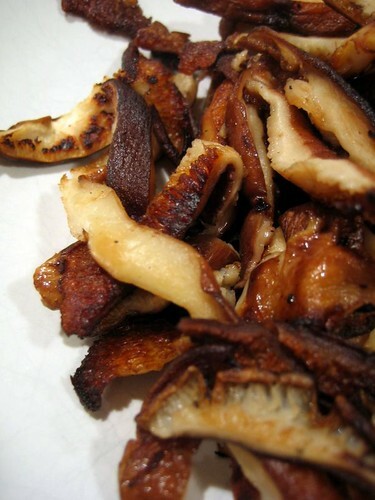 They’re actually one of my favorite vegetables, and have been ever since I was a kid. Nonconformist that I was even then, I have always loved beets, and their accompanying greens, in every form I could get them. One of the beauties of beets is that you get two vegetables for the price of one if you buy them with the tops on, as you should definitely strive to do since that keeps the beets fresh longer too. Beet greens are on the mild end of the greens spectrum, very close to spinach in texture and right next to chard, their near-relative, in flavor, but with thinner and more tender stems. 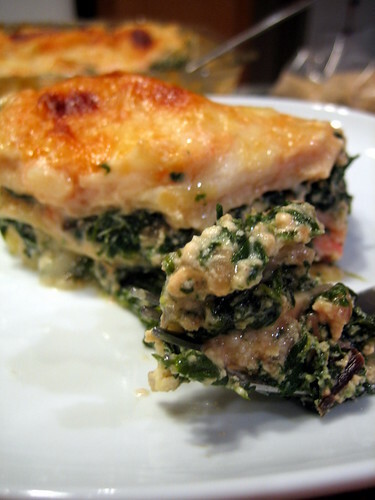 This makes beet greens an ideal replacement or companion to either, as in the filling for this luxurious, thrice-green lasagna. The combination of spinach and ricotta in lasagna, ravioli, or other filled pasta may be classic, but to be perfectly honest, it can also be kind of boring. You’re never going to offend anyone with it, but you won’t wow anyone either. Mixing in greens with a little more personality — in this case, the mellow mineral note of the beet greens and the bright peppery note of arugula — brings in genuine wow potential. Since I strongly prefer a white lasagna over a red one when the filling is this green, the more complex combination of greens creates a nice balance against the richness of the bechamel. This not-too-cheesy, creamy yet assertive lasagna is a great fit for the cooler temperatures we’re finally getting. In case you’re wondering, the beets that came with these greens were roasted — my favorite way to cook them, because it concentrates all that sweetness instead of bleeding it into the boiling water — and turned into a vaguely Eastern European salad that I will probably write up next week. Thoroughly wash all the greens, and slice the beet greens into thin ribbons. 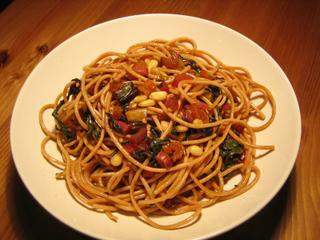 Heat the olive oil in a large, heavy-bottomed pot and saute the onion and shallots until transparent. Add the greens in big handfuls, turning with tongs to cook evenly, and adding more greens as soon as the batch before wilts down enough to make room. Once all the greens have wilted, set them in a strainer over a bowl until most of the liquid has drained off. Squeeze thoroughly to remove any remaining liquid, then turn the greens out on a cutting board and chop into bite-sized pieces. 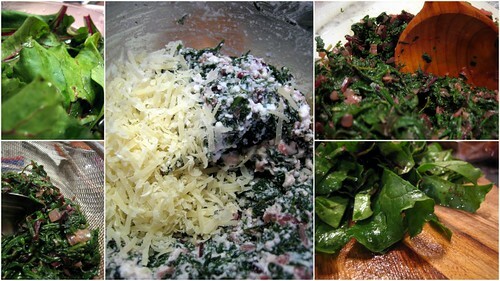 Put the greens in a bowl, stir in the ricotta and 1/4 cup parmesan, and season assertively with salt, pepper and nutmeg. Combine the butter and the minced shallot in a saucepan and cook over medium heat until the butter has completely melted and the shallots have softened. Whisk in the flour and cook for an additional minute or two, then whisk in the milk. Simmer for at least five more minutes, stirring regularly, until the sauce is well thickened. Spread an 8×8 Pyrex pan with enough sauce to generously cover the bottom, and nestle in enough noodles to form a single layer without overlaps. Spread several tablespoons of sauce over the noodles, add half the filling in an even layer, and sprinkle with a handful of mozzarella. 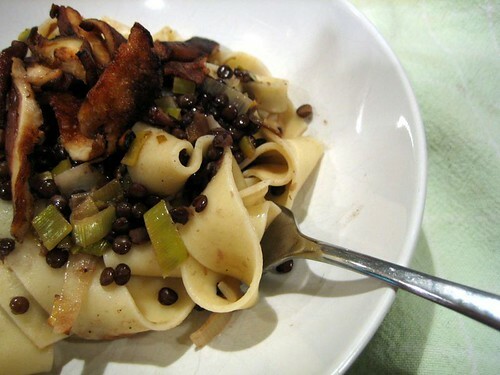 Repeat the layering process with the remaining half of the filling, topping with a third layer of noodles. Add the tomato puree to the remaining sauce, pour the sauce over the top layer of noodles, and sprinkle the rest of the mozzarella and parmesan evenly over the top. Cover the pan with foil and set on a baking sheet in case of drips. Bake for 30 minutes, then remove the foil and bake another 15 minutes, until the sauce is bubbling, the noodles yield to a sharp knife, and the cheese is golden-brown. Switch on the broiler and cook for an additional 3-5 minutes for a really brown and burnished top. 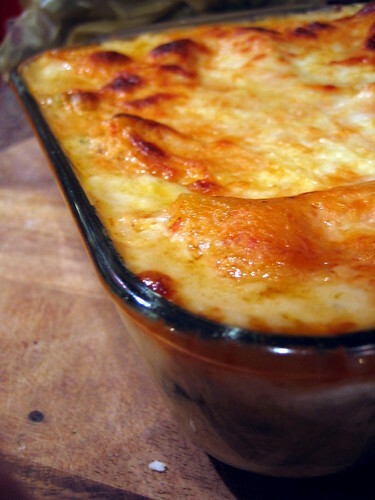 Cool for 10-15 minutes to firm up the lasagna and prevent serious roof-of-mouth burning. Be sure to season the filling really aggressively, since the noodles, cheese and sauce will mute the flavor a bit. The addition of the small amount of tomato puree to the sauce is not enough to impart noticeable tomato flavor; it just adds some color and used up a small amount of canned diced tomatoes I had lying around anyway. You could easily leave that out. If you don’t have beet greens, you could use a large bunch of Swiss chard instead, but trim away the stems and just use the leaves here. The stems can be chopped and added to soup or pasta with olive oil and garlic later in the week, but they’re a little too firm for this filling. This is what a genuine thirty-minute meal looks like. Dinner at the Disdain manse this evening was a colorful, healthy, economical, and realistic dish of whole wheat pasta with chard and toasted pine nuts, prepared in twenty-nine minutes and change. It did not involve any wacky uses of convenience foods, nominal dressing-up of prepared items, juggling a dozen products between the cupboard and the stove, or bacterial cross-contamination. With the exception of the chard, which I bought at the farmer’s market over the weekend, all of the ingredients are cupboard staples, and since it’s just me and the Lord (I mean Mr. Disdain, not Jehovah), there is enough left over for us to have tomorrow’s lunch taken care of as well. And I only have one pasta pot, one wide saute pan, a pair of tongs, a ladle, a cutting board, and a chef’s knife to clean up. Start a large pot of water boiling for the pasta. Once the water boils, salt generously and add the pasta. Meanwhile, chop the stems of the chard thinly, and slice the leafy part into ribbons. Mince the garlic. In a wide saute pan, heat the olive oil over medium heat and add the chard stems, garlic, pepper flakes, and two good pinches of salt. Saute until the stems begin to turn tender, then add the shredded greens, in two batches. Continue to saute until the greens begin to wilt, then add the balsamic vinegar and a large ladleful of the water from the pasta pot. Stir occasionally until the greens are tender, adding more pasta water as necessary. Once the pasta is cooked, remove it from the pot with tongs and drop it into the saute pan, stirring over the heat until all the liquid has evaporated. 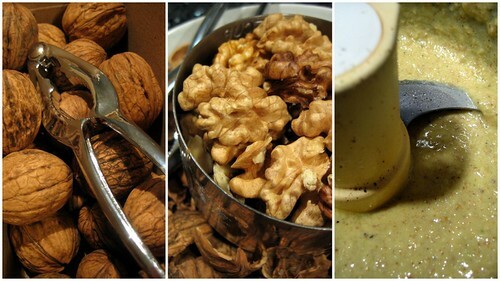 Add the pine nuts, toss again to combine, and serve. Notes: The balsamic vinegar may sound like a weird addition, but greens really like a bit of acidity, and it’s perfectly traditional in Italian cooking to go for the agrodolce (sweet and sour) effect that way. I frequently emphasize the effect by adding some golden raisins, briefly soaked in hot water while I’m preparing the other ingredients to soften them a bit. Perhaps it’s my Italian blood, or perhaps it’s just the carbs, but there’s something wonderfully calming about the ritual of preparing and eating a plate of spaghetti aglio olio (spaghetti with garlic and olive oil). It’s so easy to prepare that it’s my standard mid-week I-can’t-deal-with-cooking dinner of choice, but I still never get sick of the silky, smoky tangle of noodles, although I do add variety by throwing in halved cherry tomatoes one night, a handful of chopped basil another night, a sprinkle of incendiary red pepper flakes yet another night, or a generous scattering of crackly golden pan-fried bread crumbs still another. The only two tricks I’ve discovered to preparing it properly are 1) you must not, under any circumstances, burn the garlic, and 2) you must slightly undercook the noodles and finish them off in the pan you warmed the oil and garlic in. I learned the secret of both from Lidia Bastianich, one of the least irritating of the celebrity chefs, and so like my grandmother that I feel completely comfortable whenever I watch her. Lidia’s method is to warm several thinly sliced cloves of garlic and several tablespoons of good (but not necessarily extra virgin) olive oil in a large, shallow pan on low heat while the pasta is boiling on another burner. 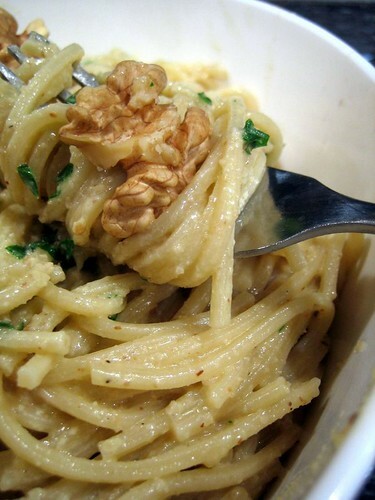 When the garlic starts to barely turn golden, drop several large ladlefuls of the pasta water into the pan, which will stop the garlic from getting any darker and also provide just enough liquid to finish cooking the pasta and serve as a vector to carry the garlic flavor into the pasta, instead of just leaving an oily film on the outer surface. When the pasta is almost al dente, scoop it out of its pot (I use tongs) and deposit it into the pan, turning up the heat a bit and stirring it gently until all the liquid is absorbed. This entire procedure takes less than twenty minutes, and can be done on autopilot after the worst possible day, but I try to concentrate on the flow of it all the same, turning it into a meditation that nourishes the soul as well as the body.